When it boils down to it, I’m afraid of two things in this world: bugs and myself. It’s a short list, but those two fears can take many forms. June bugs, wasps, cockroaches, ticks, cicadas, crickets, and any kind of spider make my hairs stand on end. For many years, I couldn’t even comfortably look at a picture of a spider, and if I come unexpectedly upon one in real life, I will respond with a raptor-like screech. Logically, I realize that bugs aren’t something to fear, but rationality and fear don’t always work in tandem. Fear came home to roost last week in the form of a mud dauber. While lounging in bed talking on the phone one day, I heard a steady reverberation near my window. Peering through my blinds, I came face to face with a wasp who was seemingly trapped behind them. Not knowing what to do, I decided to do nothing. “He’ll die soon,” my instincts told me. Days went by, and I would occasionally hear what I figured was a lively death rattle. Suspicious after almost a week of this, I once again peeked to see what was impeding his death. To my horror, I discovered the busy buzzing was actually the sound of productivity: the trespasser had built himself a nest on top of my blinds. After hysterically waving my hands around and swearing for a minute, I pulled the blinds off the window and took them outside where I beat the nest with a spatula. It burst apart like some grotesque pinata, a spray of larvae and colorful spiders, some still half-alive, triggering the pinnacle of my revulsion. When I returned to my bedroom, I came upon the mud dauber himself, who was zooming around the room in frantic circles. I sprayed him with Windex until he dropped dead into my air vent. And that was the end. 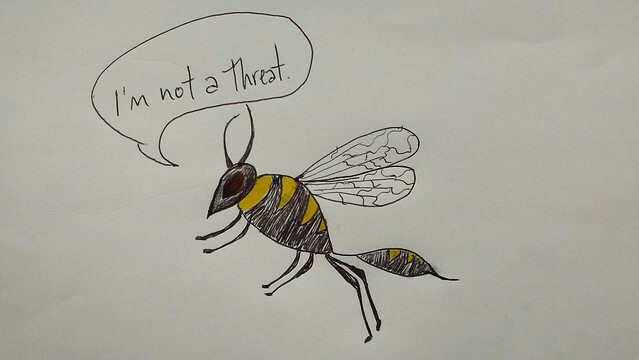 The irony is that I, of course, turned out to be a much bigger threat to that wasp than he was to me. He was just going about his business. He didn’t see himself as an intruder, but fear led me to destroy a home and a family that day. I guess that’s life. 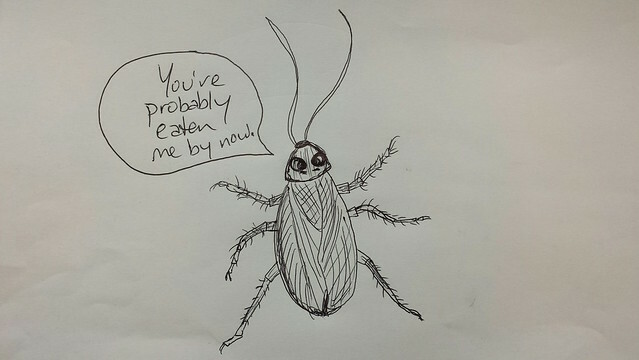 I will leave you with a fun bug fact totally unrelated to wasps: Cockroaches are found so often in processed food that studies have suggested people with chocolate allergies are more likely allergic to cockroaches. An average of eight bug parts are present in every chocolate bar. That’s FDA approved.